Shacharis: 9 AM /Sof Zman Krias Shema 10:15 AM/FULL KIDDUSH! Erev-Shabbos Farbrengen in the CSTL Social Hall, in honor of the Yahrzeit (11 Cheshvan) of the Rebbe, Rabbi Nachum of Chernobyl, a disciple of the second leader of the Chassidic movement, Rabbi DovBer of Mezeritch, and the founder of the Chernobyl dynasty of Chassidic Rebbes. www.chabad.org/calendar . SHABBOS KIDDUSH AND SEUDA SLISHIT. Full Kiddush! Co-Sponsored by the Greene and Dershowitz families in remembrance of the yahrzeit’s of Laura (Leah bat Mordechai) Greene ZT”L, Efraim Alter ben Shmuel Dershowitz ZT”L, Chana (Tikva) bas Yechezkel Leib Dershowitz ZT”L, Ron Goldberg ZT”L and Chaim Don Tziprin ZT”L, may their memories be for a blessing. A delicious meat cholent will be made by Rabbi Mendy Levitin, sponsored by Rabbi Mendy and Lehala Levitin and their son Shmueli in honor of the birthday of their daughter "Tali"רייזל ייטל, and in honor of the Yahrzeit of Rachal Imanu (11 MarCheshvan). Seuda Slishit Lite. Thank you to Anonymous Donor and Rabbi Mendy Levitin for making full kiddush possible again with our new commercial refrigerator! Tizku L’Mitzvot! For current status of the North Seattle Eruv, please check the flag on the NE 65th Street side of CSTL, (green flag means the Eruv is up, red flag the Eruv is down), CSTL eNews, or the Vaad eNews. Visit our web site www.twitter.com/cstleruv for current status. 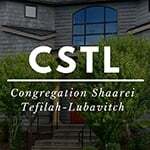 If you would like to sponsor Kiddush at CSTL, please contact Marion Kitz Gabbai Kiddush, miriamkitz@hotmail.com . Contact Marion to sponsor a Kiddush for a BIRTHDAY, ANNIVERSARY or YAHRZEIT. Please inform Marion by the preceding Sunday evening so that we have time to prepare properly. Prices: Sponsor $350, co-Sponsor $175, Contributor: $50-$149. at Third Place Books. Pnina Granirer, is one of the Romanian Jews sold by the Communist government in Hungary to the state of Israel after World War II. In Israel, Pnina studied art at the Bezalel Art Academy and became a renowned artist, helping to co-found an amazing institution called Artists in Our Midst in Vancouver, where she now lives. Rabbi Yehoshua Levy, Executive Consultant for Torah U'Mesorah at BCMH. The community is invited to attend. The Grow curriculum was created by Chabad International and has been thoughtfully designed by top experts in the fields of education and parenting, to empower kids with the skills and strengths to be leaders and to make a positive impact on the world around them. We will be offering the seven-week program three times during the school year. To learn more about how your child can join, contact Mrs. Shimona Davidoff at (206) 941-7037. SEPHARDIC DAY AT THE J - SUN OCT 21st 11am-2pm. www.StandWithUs.org Early bird registration deadline is Sept. 30. Free, eight-hour course by Jewish Family Service prepares you to interact with an adult in crisis and connect them with help. At JFS, 1601 16th Ave., Seattle. The Torah relates that the first command which G‑d gave the first Jew, Avraham, was “Go out from your land, from your birthplace, and from your father’s house, to the land that I will show you.” This raises a question: On the surface, it would seem more appropriate that the first command given to a Jew would clarify the nature of service to be rendered to G‑d. a) On the surface, since the intent of G‑d’s command was for Avraham to journey to a different land, it would seem more appropriate to say, “Go to the land that I will show you.” Why is it necessary to mention the place from which Avraham had to leave? Even if that was necessary, why is it necessary to elaborate, “from your land, from your birthplace, and from your father’s house”? b) The order of the clauses, “from your land, from your birthplace, and from your father’s house” is also problematic. On the surface, first one leaves one’s “father’s house,” then one’s “birthplace” and then one’s “land,” the direct opposite of the order chosen by the verse. c) On the surface, it would have been appropriate to give Avraham some insight into the nature of the land which would be his destination so that he could prepare himself and take with him any articles that he would require there. d) This verse (in contrast to other verses in the same passage) does not mention that G‑d revealed Himself to Avraham. It relates G‑d’s command directly without any introductory remarks. The above points can be explained as follows: G‑d’s command to Avraham to leave Charan began the preparatory service for the giving of the Torah, the event which forged the identity of the Jews as G‑d’s chosen nation. Thus, this command expresses the fundamental principles which characterize the service of the Jewish people. A Jew lives in a physical world which is governed by the forces of nature which conceal G‑dly light. Furthermore, he is born with certain natural tendencies and is influenced by his environment. Nevertheless, he has the potential to rise above these limitations and, through the Torah and its mitzvos, serve G‑d who transcends all these limitations. He can reveal G‑dliness within the world and elevate the world above the level which it could otherwise attain. Though “the world was created in a complete state”1 a Jew has the potential to lift it to a higher level of completion. The Midrash explains that before the giving of the Torah, there was a decree separating the higher realms from the lower realms. The giving of the Torah nullified that decree and afforded the potential for the Jews to ascend to the higher spiritual realms while living in this material word and to reveal G‑dliness in this lowly, material world. Based on the above, we can resolve the difficulties mentioned originally. Since a person must depart from his original state, it is necessary to describe that state in detail, mentioning the three influences (in ascending order of difficulty) which shape his character. Since his goal is Mesirus Nefesh, giving himself over to G‑d to the extent where he no longer feels his individual will, nor is governed by his on intellect, his destination is only described as “the land which I (G‑d) will show you.” He knows nothing about his destination, nor is it necessary for him to do so. The above also allows us to understand why this command preceded G‑d’s revelation to Avraham. Only after a person departs from his original state and journeys to “the land which I will show you,” i.e., he units with G‑d’s will, is he a fit vessel to receive the revelation of G‑dliness. 2. The service of leaving one’s “land, birthplace, and father’s house” is not only personal in nature. Rather, it also involves the elevation of one’s family and surrounding environment Thus, we find that Avraham took Sarah, his wife, Lot, his nephew, his property, and “the souls which he made in Charan” together with him on his journey. Based on the above we can understand the connection of the be­ginning of the parshahwith its latter portions which describe in detail the story of Lot, how his shepherds and Avraham’s quarreled, his set­tling in Sodom, the war of the kings, and the miraculous manner in which Avraham saved him from captivity. On the surface, Lot’s story represents the direct opposite of the Mesirus Nefesh displayed by Avraham as Rashi quotes Lot as saying after departing from Avraham: “It is impossible for me to tolerate Avraham or his G‑d.” Similarly, his choice of Sodom as a place to live despite the wicked behavior of its inhabitants reveals the nature of his own character. Nevertheless, Avraham’s efforts to elevate and refine his surroundings, to take them with him on his journey from his “land,” “birthplace,” and “father’s house,” “to the land that I (G‑d) will show you” also had an effect on Lot. Though Lot remained a wicked person, he still maintained a connection with Avraham. This connection was not only one-sided. It also had an effect on Lot, refining him to the point that he continued showing hospitality to guests in Sodom despite the danger involved in such an activity. As the parshah relates, the inhabitants of Sodom would punish any act of hospitality harshly. Though he was conscious of this danger Lot was influenced by the training he received in Avraham’s household and eagerly sought to bring guests into his home. This self-sacrifice9 reflects how Lot was affected by Avraham’s service. Thus, the journey “to the land that I (G‑d) will show you” lifts a person beyond his limits as a human being, a creation, and establishes his identity as a servant of G‑d, willing to do His will — whatever that implies — with a commitment of Mesirus Nefesh. “The deeds of the fathers are a sign for their descendants.” [The Rabbis explain that this implies that our ancestors’ deeds endow us with the potential to follow in their footsteps.] Thus, Avraham’s settling in Eretz Yisrael made that land an eternal inheritance for his descendants. Because of his acts, every Jew in any era possesses a portion in Eretz Yisrael. Similarly, Avraham’s spiritual service served as a preparation for the service of his descendants. Thus, his journey from his “land,” “birthplace,” and “father’s house,” is a source for every Jew to serve G‑d with Mesirus Nefesh. Although a Jew lives within the limits of worldly existence, he can depart from his individual existence — even if that existence involves holy matters — and give himself over entirely to G‑d’s will, devoting himself to transforming the world into a dwelling for G‑d. Furthermore, this covenant was established with the help of G‑d, Himself. Our Sages relate that Avraham was afraid to carry out the circumcision and G‑d helped him, “extending His hand and holding the knife together with him.” Thus, he and G‑d became partners in the fulfillment of the mitzvah.10 This partnership demonstrated the complete nature of the union with G‑d and His will, with that union being reflected in Avraham’s physical being. The connection between the mitzvah and Avraham’s physical being is further emphasized by the physical pain the circumcision caused. The explanation of the concept is: Since circumcision establishes a covenant with G‑d in our actual flesh, the covenant must be forged in a manner that reflects the nature of our flesh. Since, by nature, we feel pain when our flesh is cut, that pain must be felt in connection with the fulfillment of this mitzvah. The complete union with G‑d that Avraham established through the circumcision is transmitted to all his descendants, allowing them to establish a complete connection with Him, a connection that effects even their physical beings. In particular, greater potential for such service is granted this year, תש"נ, “a year of miracles.” This year each Jew is given special powers to rise above the natural order. Furthermore, he has the potential to elevate his family and his surrounding environment15to a higher plane as well. To gather together every Shabbos to study Torah communally: As mentioned previously, it is appropriate that in every community where Jews live, they should gather together on Shabbos to study Torah, both Nigleh and Pnimiyus HaTorah, and make good resolutions concerning their service in Torah, prayer, and deeds of kindness. In particular, at this time, it is appropriate to take on resolutions regarding the needs of the community. In order to unite all the different communities together, it is appropriate that, in addition to the established Torah classes, every community should join together in the study of a single subject. This study should center on the weekly Torah portion, studying at least several lines as they are interpreted by one commentary in the realm of Nigleh and one commentary in the realm of Pnimiyus HaTorah, Chassidus.16 In the realm of Chassidus, to save everyone the trouble of finding appropriate subject matter, it is suggested to study the discourses of the Tzemach Tzedek in the series Or HaTorah which includes explanations of many of the verses from the weekly Torah portions including the first and final verses which are often regarded with special appreciation by Torah students. This practice should also be followed in all Jewish organizations and institutions. The director of the institution should distribute money to be given to tzedakah to all of the employees at least once a week. Similarly, this practice should be followed in organizations and institutions that involve gentiles since tzedakah is necessary for “the settled nature of the world.” (Accordingly, some authorities consider it one of the seven universal laws given to Noach and his descendants.) In particular, this applies in America, where tzedakah is one of the pillars of the country. The above points should be publicized wherever possible. Surely, the suggestions will be accepted and bring greater success than that which was originally conceived. May our efforts in Lech Lecha — going out from our previous position with mesirus nefesh— bring about the era when G‑d will take us “to the land which I will show you,” Eretz Yisrael, with the coming of Mashiach.